We think that the easiest way to find your way around a city is to choose a centre point and then divide the city into smaller districts. For Bristol our centre point is the site of the old Bristol High Cross which was sited at the junction of Corn Street, Broad Street, Wine Street and High Street. From here you can get to anywhere in the city centre within fifteen minutes. We have divided Bristol into four districts, and each district is divided into smaller chunks too. The areas are: the City Centre, rather sprawling with many of Bristol's main attractions including the harbourside; Clifton, the city's affluent suburb; the Inner City, home to Bristol's independent retailers; and finally the Bristol Suburbs, the outskirts of the city with good motorway access and ideal for business travellers. For simplicity, we have included parts of South Gloucestershire and some other counties within the Bristol Suburbs region. The popular area of Clifton is a strange mix of students and an upmarket residential area. Sights include Bristol Zoo, The Downs and the Clifton Suspension Bridge over the Avon Gorge. Starting at the top of Park Street, it is about a 30 minutes walk north west to The Downs. 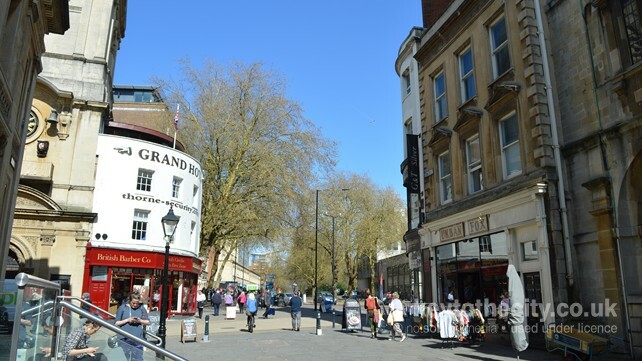 Just outside of the city centre is Bristol's business and residential areas. The new development of Temple Quay sits alongside the independent traders of Old Market, Stokes Croft and Bedminster. The distance to the city centre from this area is a 20 to 50 minutes walk. Areas in the suburbs of Bristol and South Gloucestershire include Cribbs Causeway, Filton and Henbury in the north - great for motorway connections, Hengrove, Brislington and Bitton in the south - good for visits to neighbouring Bath. Map showing our centre point for Bristol. Use the links below to view Bristol on popular mapping websites.